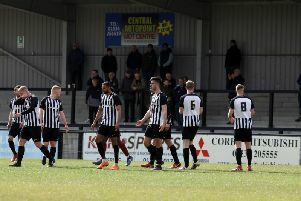 Tommy Wright believes there will be a different mentality within his Corby Town squad next season after he made his first moves of the summer this week. The Steelmen completed four signings as the rebuilding job begins following their relegation from the Vanarama National League North. Youngster Danny Draper agreed a new one-year contract with the club while central defender Brad Gascoigne returned for a third spell at Steel Park. Former Birmingham City midfielder Reece Webb and ex-Gloucester City winger Femi Orenuga completed Wright’s first pieces of business ahead of a new era for Corby. The first-team squad will be training full-time in line with the club’s academy once pre-season gets under way. It looks likely that the Steelmen will be preparing for a campaign in the Evo-Stik Northern Premier League Premier Division. And Wright has admitted to there being a change in direction as he revealed he will be assembling a “young and hungry” squad. “To be honest, I was at the presentation evening on Saturday and I said to our secretary Gerry Lucas that it was going to be fairly quiet,” the Corby boss said. “And then by Sunday evening, I told him I was ready to sign four players so he was a bit busier than he might have expected! “I have spoken to a lot of players and it’s been good. I have basically told them straight what we are offering and I am leaving it to them. “I am very much more relaxed than I was this time last year. I think what we are doing is quite unique and I think players are interested. “We will be in a situation where our youngest player will be 17 and the vast majority will be under 25, it will be a young and hungry group. “There will be lads who will have aspirations of continuing at a higher level in the future and that’s what I want, I want scouts coming here and looking at our players. “The whole mentality will be different to last season.